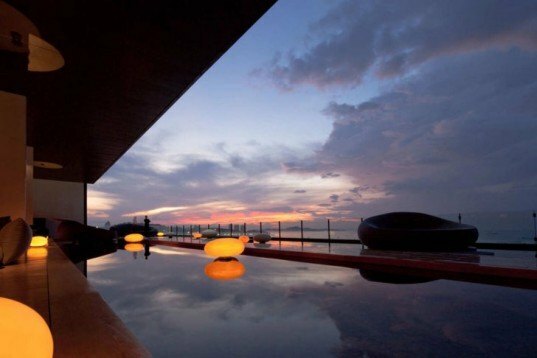 Designed by Bangkok-based Department of Architecture, the Hilton Pattaya luxury hotel in Thailand recently unveiled their dazzling new interior spaces, which have been inspired by the sea currents and beaches found just outside the hotel. With installations on the first floor lobby, the main lobby, the bar and other common use areas, the new decor brings the hotel to the forefront of modern interior design. Being the fourth Hilton hotel in the country, the Hilton Pattaya is also in line with the brand's global sustainability efforts. The Hilton Pattaya hotel in Thailand is an oasis of natural luxury and relaxation that features long pools of calm water stretching out from its entrance. 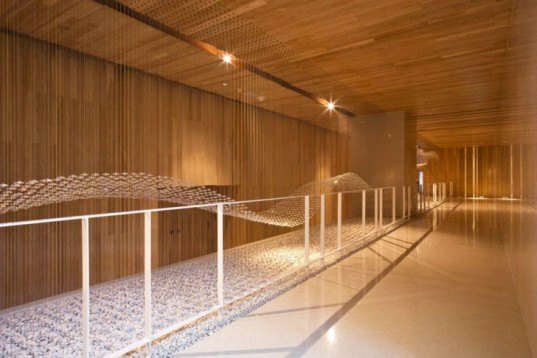 The stunning 302-room property’s main lobby and desks on the ground floor have been decorated with a wavy ceiling installation made from natural fabrics that resembles the sea’s deep currents. Located in the heart of the city and overlooking the beach and bay, the eco-lux hotel recycles its own water and materials, and it has been designed echo the nearby ocean through its fantastic interior decor. 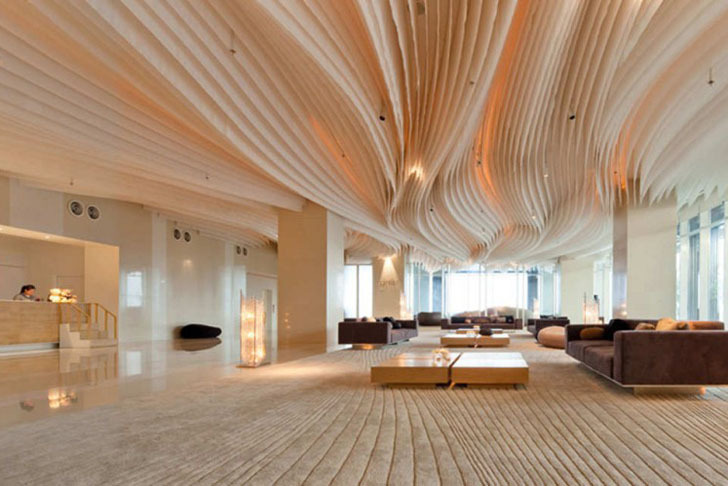 High on the 17th floor, the same wavy fabrics have been used for the Drift lobby and bar. Textile waves flow through the bar and sitting area, while shiny surfaces reflect the undulating shapes to create an underwater aesthetic that is both magical and unique. The bar’s outdoor terrace features round pebble-esque furniture, floating candles, and a tranquil pool space with stunning views of the city and sea that are best appreciated before the sun sets in. The undulating deep-sea motifs are also present in many of the common areas like corridors and halls. Using a delicate palette of whites, ochers and pinks, Department of Architecture created various glass installations that reflect light and sparkle in style. They left no area unattended – even the stairs has been decorated with energy efficient lights. The bathrooms have been designed with the same luxurious marine style as well – they feature Dazzle Design‘s hanging cascades of translucent sea-shells, which create an underwater atmosphere that reflects the Hilton’s natural environment. Looks awesome but is it green, is it sustainable, did they use cradle to cradle materials? The Hilton Pattaya hotel in Thailand is an oasis of natural luxury and relaxation that features long pools of calm water stretching out from its entrance. 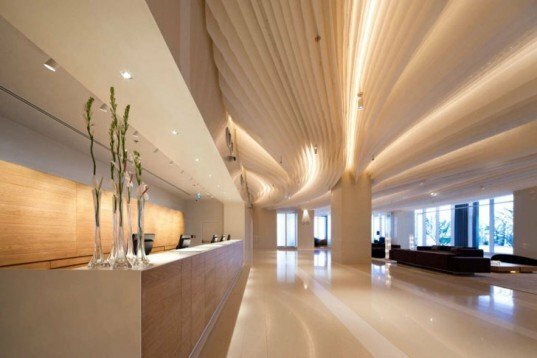 The stunning 302-room property's main lobby and desks on the ground floor have been decorated with a wavy ceiling installation made from natural fabrics that resembles the sea's deep currents. Located in the heart of the city and overlooking the beach and bay, the eco-lux hotel recycles its own water and materials, and it has been designed echo the nearby ocean through its fantastic interior decor. High on the 17th floor, the same wavy fabrics have been used for the Drift lobby and bar. Textile waves flow through the bar and sitting area, while shiny surfaces reflect the undulating shapes to create an underwater aesthetic that is both magical and unique. The bar's outdoor terrace features round pebble-esque furniture, floating candles, and a tranquil pool space with stunning views of the city and sea that are best appreciated before the sun sets in. The undulating deep-sea motifs are also present in many of the common areas like corridors and halls. Using a delicate palette of whites, ochers and pinks, Department of Architecture created various glass installations that reflect light and sparkle in style. They left no area unattended - even the stairs has been decorated with energy efficient lights. The bathrooms have been designed with the same luxurious marine style as well - they feature Dazzle Design's hanging cascades of translucent sea-shells, which create an underwater atmosphere that reflects the Hilton's natural environment. Even the toilets have been designed with the same luxurious marine-style featuring hanging cascades of translucent sea-shells.